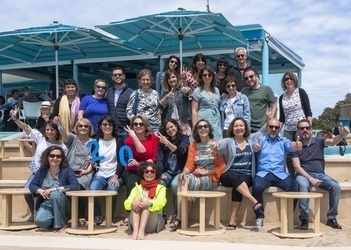 The Formentera Council's tourism department reports that when the seventh Formentera 2.0 hits the island from May 2 to 5, international experts will be on hand to share experiences in communication, creativity and emerging technologies. Director Rosa Castells says the event will find “the leading lights of digital culture rendezvousing here on the island”. “Formentera 2.0 has put the island on the map”, asserted the organiser. “Today Formentera is more than just a tourist destination; our line-up of world-renowned experts means we're also an authentic talent magnet”. The encounter is a chance to connect, share and learn in a familiar, low-key environment far from sprawling convention centres. Whether you're a full-fledged tech devotee or more of a digital dabbler, Formentera 2.0 is a multi-disciplinary event for a wide range of profiles. Journalists, communication professionals, creative types, entrepreneurs, heads of communication and marketing, community managers, freelancers, content managers, institutions, organisations, bloggers and anyone keen on getting up to speed on emerging tech, communication and digital culture will feel right at home. Though 50 individuals have already registered, space is still available. Full programme details can be found online at www.formentera20.com. Anaïs Pérez Figueras, communications director for Google Spain and Portugal; Ricard Robles, director of Sónar festival; Tomás Fdo Flores, director of Ràdio-3 and Siglo 21; Enric Jove, CEO of Mc Cann, advertising and marketing mavericks behind award-winning spots for Ikea and Campofrío; Macarena Rey, CEO of Shine Ibèria production commpany and executive producer for Masterchef and Maestros de la costura; and Oscar Romagosa, executive producer for Canada, the production company behind two music videos for two-time Grammy-winner Rosalía. Other Formentera 2.0 participants include Disney Channel director general Vincent Sourdeau and Ana Gea, founder of the leading design and creativity magazine Graffica.